In last month’s TLV, we looked at mass polarization (polarization amongst citizens) and elite polarization (polarization amongst politicians). While we are growing more polarized on the mass level, we citizens have remained generally and relatively centrist on the issues. The most interesting theory explaining this paradox is the idea of affective identity, or group identity, which has infused partisan politics in recent decades. By mere party identification, we develop negative feelings of the opposition. Repeat and sustained exposure to media-based campaigns about the other side only reinforces these negative emotions. Meanwhile, as our mass polarization widens, so too does our elite polarization, which in turn is causing our politicians to become more ideologically extreme. This appears to have several effects, like more executive orders from the office of the president and more Supreme Court legislation from the bench. Both are attempts (however misguided) to compensate for the lack of legislation getting done in a deeply divided Congress. Which is the chicken and which is the egg? It’s hard to say. Everything seems to feed off of and need each other to sustain in this cycle. What is most counterproductive is hating the citizen whose political opinions differ from yours. This feeds chaos and stymies rational, un-emotional, civil discussion about our challenges and productive solutions to them. And, in the chicken-egg scenario, this lack of conversation with our fellow citizens on the other side of the political spectrum feeds elite polarization, which further entrenches our problems. The cycle continues. It behooves the political class for us to loathe each other. They can exploit this anger and fear to justify their agenda du jour. How do we break the cycle of mass and elite polarization so that we can have critical conversations as we face serious global economic and security issues? One of the reasons we despise that person who votes the other way is because of how little we engage with them. When we don’t regularly partake in conversation with those whose party affiliation is not ours, as much data says is the case, then we fail to understand where they come from and we miss opportunities to find common ground. When we don’t interact with those in the other party, all we have to go off, then, is what the media tells us they are. And the media tells us they are uninformed, wrong-headed people with sinister agendas, right? Not like us; we have noble, smart agendas. Last month, we touched on, but did not delve into, the media’s role in our record levels of mass polarization. In this TLV, we consider the media’s role in our polarization and how they manipulate us. And we try to uncover their motivations for hijacking our brains to prevent us from thinking on our own and overly-rely on them for information and analysis. Economists Matthew Gentskow and Jesse Shapiro did a methodical analysis to determine if and which newspapers had a partisan bias. By matching language repeatedly used by Republican and Democrat politicians to language in newspapers, they generally found their media research subjects to have a slant. But they were more interested in why. Was it because the media owner wanted to push a certain agenda? Or because the writers at a paper all tended to have a similar bias? Not so, according to their findings. The most striking factor driving the slant of a given paper was the voting patterns of a paper’s readership. Gentskow and Shapiro concluded that newspapers are just like any other firm in the economy. They are trying to make money and, thus, aiming to please their consumers by giving them what they want. If this is true, then it means that the average newspaper reader wants his or her opinions validated. What does this say about us? We want fries with our burgers and affirmation with our “news.” This is well supported by research. In the fall of 2014, Pew released a report on political polarization and media habits and found that partisan association impacts media consumption choices and levels of trust. Conservatives overwhelmingly go to Fox News for their news. Liberals claim a broader range of news sources (conservatives would likely retort that they don’t have as many conservative-learning options as liberals have liberal-leaning options). 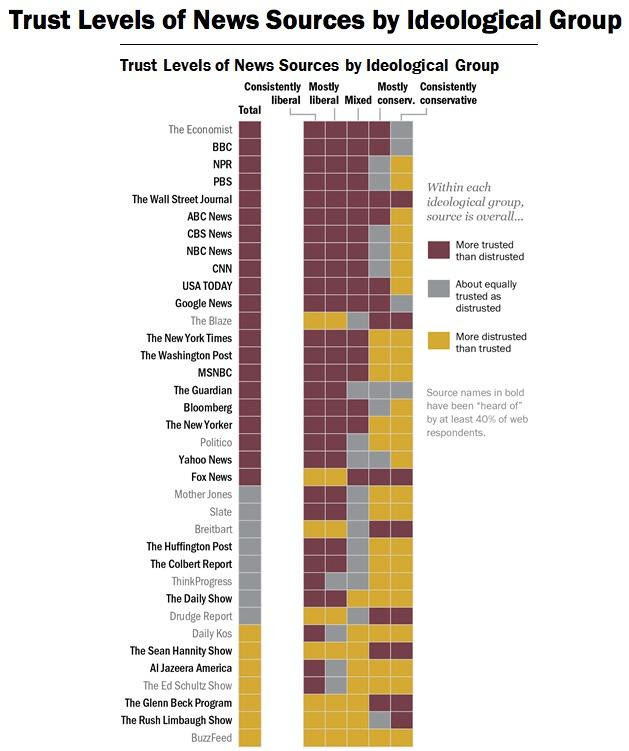 There’s clear and deep partisan bifurcation when it comes to trust in certain media outlets. Why we choose news sources that affirm our beliefs could fill a book. But at least one consequence is clear: we are pawns in the media’s moneymaking game, and in turn, we reinforce any media outlet’s need to promote a bias to survive. It makes sense, then, that biased media would exacerbate polarization. Worse still, we live in a world with a 24-hour news cycle, endless talk and public radio programs, the Internet and its mass proliferation of media outlets, not to mention how social media amplifies their existence and access to them. According to philosopher and writer Alain de Botton, when we are so besieged with information, much of it useless, there’s little room left to think. de Botton believes that the media tricks us by giving us “interesting” news stories, but never in a worthwhile context. When we have so many information options, we’re not likely going to follow a story over the long-term, consider it within a larger context or think deeply about it. Amid overload, we are satiated by bits of information that validate our biases and often leave us stewing, not thinking. Ultimately, we are passive consumers of the news, parroting what our preferred pundits tell us. The late Christopher Hitchens was a fervent critic of the media. The self-avowed leftist and occasional neocon regularly took down institutions like The New York Times for “lying” and purposefully and systematically occluding readers’ ability to think fully and clearly. Hitchens was a champion of independent, rigorous thinking and he often cited it as the most important safeguard of freedom of speech and expression. In 1998, Hitchens joined a panel of journalists from the “alternative” news media (and Walter Isaacson, who at the time was Time magazine’s managing editor, and was asked to be the lone face of mass media before a hostile, idealist audience). 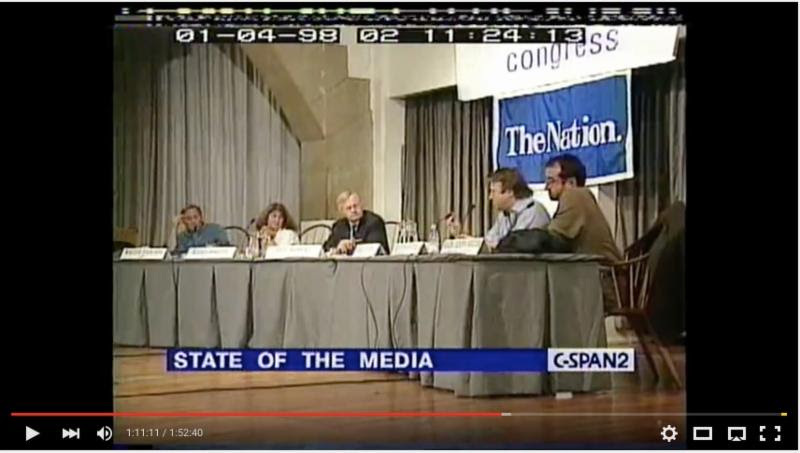 The event, hosted by The Nation to explore the state of media, was broadcast on C-SPAN. If you have two hours to kill, it’s a fascinating thing to watch. It reminds us that everything changes and nothing changes. Their debate is both relevant and irrelevant today, as media bias is shown to be a conversation that’s been had for centuries, and it’s apparent the panelists hadn’t yet felt the full force of the Internet. Hitchens makes some of the most astute points on the panel, cautioning that media bias exists on a far deeper and more basic level than we might think. To him, it stems from a larger question of whether or not objectivity, and news delivered wholly free of any editorializing, is even possible. But for our purposes, we’ll focus on his primary point. Look to the language, he urges, and take none of it for granted. As an example, the word “partisan” in the media is always used as a pejorative, and the word “bipartisan” is an “automatic compliment.” The American media would, he says, indignantly deny that the U.S. is or that they would want a one-party state, but their language betrays them. After all, what are their intentions in and the implications of praising bipartisanship and demonizing partisans? What is the subtext of attempting to malign bipartisanship? What are their underlying assumptions, and why? How does the media benefit from tacitly propagating this notion? Hitchens reminds us that there is hypocrisy and dishonesty everywhere in the media. What does the corrections page of a news outlet imply? It lets a media outlet look like they are steadfast in their pursuit of accuracy and implies that everything not listed there was “correct.” He points to another media darling – how campaign finance distorts democracy, manipulates voters and skews elections. But does the media ever acknowledge that the lion’s share of those political donations is intended to buy media? Does the media ever cop to the fact that they are the primary beneficiaries of campaign finance? They cannot. They are a business like any other, and they must self-sustain. This means giving their specific consumers what they want and saying nothing to damage themselves, lest they jeopardize their survival and power. 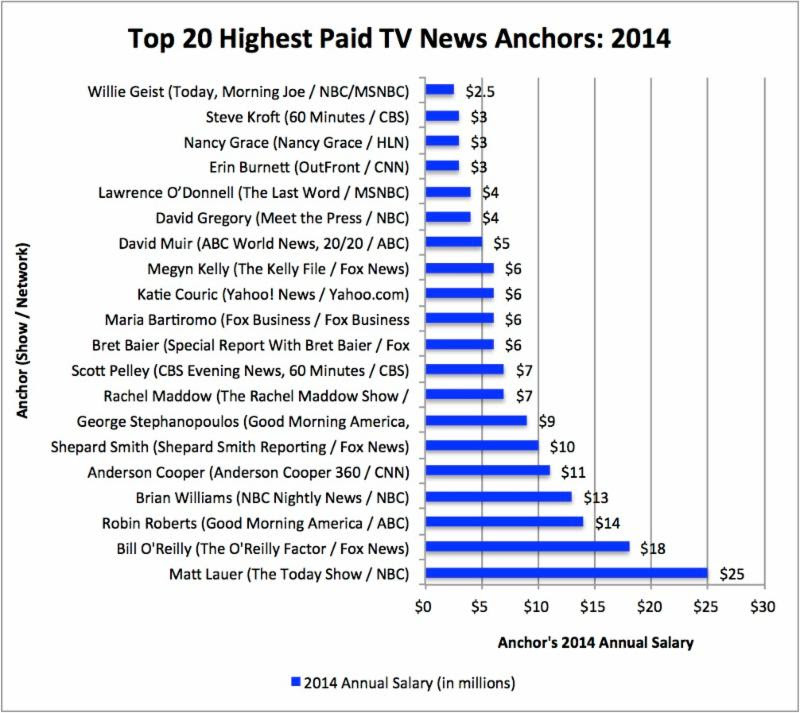 Can we imagine the outrage and financial consequences if MSNBC began slanting right, or Fox News left? What does it say of us that we have little to no to tolerance of our chosen media betraying their unspoken bias? Ultimately, Hitchens puts the onus on the consumer of news – to look closely at even the most common language, to sniff out the underlying assumptions, to ask smart questions and to push back on the media for its most subtle, insidious forms of bias. And this includes our chosen media as well. It’s not what you know, it’s how you think, as Hitchens like to say. How do we break the cycle of mass polarization? One option – stop being played by the media, the media you choose to consume. Stop being pawns in their own self-preservation. Stop letting them infiltrate your brain and do your thinking for you so they can sell more advertising dollars as they jockey for rankings, influence, power and more profit. In this TLV, we’ll look at how the media divides us, how it manipulates and lies to us (even when it doesn’t know it’s lying to us), how it affects our ability to think and even what it does to our blood pressure. And then we’ll consider some alternatives. Are we going into a recession? Are we still in an expansion? Business media, economic pundits, even the stock market seem to be unsure. 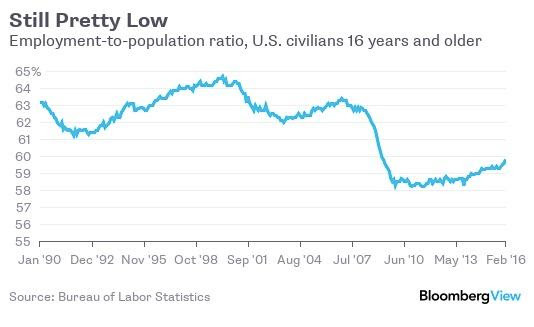 On the one hand, we have official unemployment at pretty heady lows. On the other hand, wages don’t seem capable of growing. China is still in some obvious funk. The EU and Japan have implemented negative interest rates to inspire economy. But US auto sales have hit record highs. And US household net worth is also at a record high. What gives? Ever since the 2008/2009 recession, we constantly hear about “recovery.” But wait, that Great Recession is approaching eight years ago! We’re still talking about recovery after all this time? Have we turned into perpetual pessimists, or has the wool been pulled over our eyes by the powers that be, who naturally want to stay in power? We live in a world that is very difficult to understand. Proliferation of technology has increased globalization, which has increased the amount of information available to us every day. Somehow, we have to consider all this data as we try to make all manner of choices, from consumption, to longer-term investment, to our individual careers. As this month’s TLV points out, “news” media is not helping. Current circumstances are actually to the “news” media’s benefit. The more confused we are, the more we seek an “authoritative” source for “information.” The more we watch and listen to the news, the more confused we get. It’s a self-perpetuating cycle that lines the pockets of those serving up the confusion. What is real, and what have we been manipulated into thinking is real? At this stage, the answer is unknown to us at TLV. All we can suggest is that if we turn off the news, we may at least sleep better at night. A few days ago, Federal Reserve Chairman Janet Yellen suggested that the Fed was keeping rates steady because there was too much slack in the job market and because wage growth was still too tepid. At an unemployment rate of 4.8%, one might think our job and wage markets would be the envy of the world. What is Yellen seeing that we don’t see? Maybe she’s noticing that a lot of our employment growth since 2008/2009 has been in lower paying jobs. Or maybe she’s noticing that the jobs being eliminated in our natural resources and support industries were quite high paying. Or maybe Yellen is just looking for a scapegoat other than the consequences of our interconnected, interdependent global economy, which is not part of the Fed’s mandate in determining domestic monetary policy. No matter Yellen’s motives, it is evident in the oil patch economies that many high paying jobs are rapidly evaporating, and that those lucky enough to have kept their jobs are staring at worthwhile cuts in pay. You don’t reduce revenue in any industry by 50% and not see it affect wages. A year ago, the drilling rig rough neck was fired by the rig tool pusher, who was fired by the area manager, who was fired by the regional supervisor. All those job losses were out in the rural areas of the country where oil and gas is explored for and produced. More recently, the white-collar regional managers and all manner of overhead workers who reside in corporate offices in places like Houston started to get laid off. As the tide of prosperity ebbs, the drums of self-interest grow. When the ship is sinking, it’s every man for himself. Although self-interest would seem a natural human reaction amid challenge, there have been times in history where men put the greater good ahead of the greater self. One of the most well known examples is the American Revolution, where many of the 56 signers of the Declaration of Independence subsequently suffered significant hardship or death for their actions. But maybe an even greater example can be found in Texas. It is thought that between 182 and 257 Texians (non-Hispanic residents of then Mexican Texas) died in the Battle of the Alamo. Following the take-no-prisoners Alamo massacre, it is estimated that another 350 Texians were captured and then murdered after the Battle of Goliad. 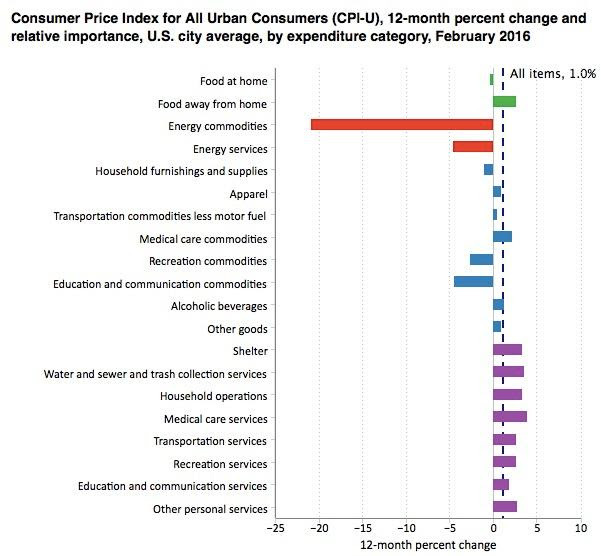 Over the 12 months ending in February 2016, the Consumer Price Index for All Urban Consumers (CPI-U) increased 1% (not seasonally adjusted), a smaller increase than the 1.4% change for the 12 months ending January. Prices of energy commodities, which include gasoline, propane, and kerosene, decreased 20.9%; these commodities had a relative importance of 3.1. The energy services index, which includes electricity and piped gas service, declined 4.6%; energy services had a relative importance of 3.6. The overall energy index, made up of commodities and services, declined 12.5%. Click the link for additional reporting from BLS and an interactive version of the chart. 56% of Americans say that the entertainment industry is less insidious to the country than the news media. 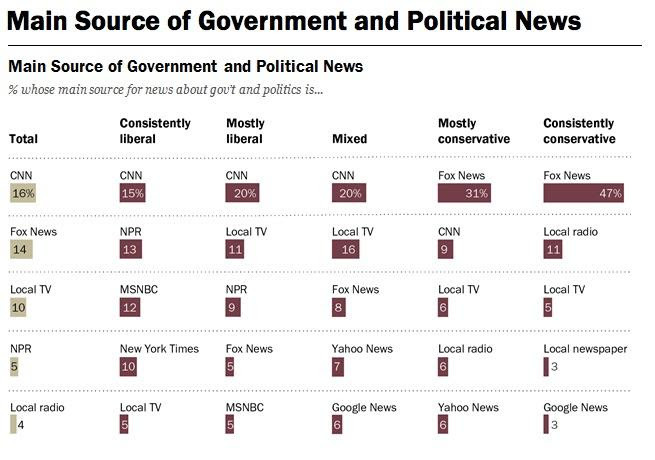 Only the federal government and Congress were perceived as having a worse effect than media. Conservatives were most harsh, with 82% believing the media has a negative impact on the country, compared to 62% of liberals. The thinking goes that a generation ago, if you wanted to watch the news, your only option was the 6pm news on three channels, NBC, ABC and CBS. They all delivered the news in the same format and, more or less, said the same thing. Today if you want to watch the news, you have multiple options during each hour of the day, on multiple outlets, all hawking different perspectives to differentiate from the competition. Has this splintering, editorializing and proliferation of the news served to polarize us more? Yes and no. We don’t just have more news choices, we have more media choices in general. We can entirely avoid the 6pm news, so to speak, and instead we can watch reruns on this channel, reality TV on that channel, this video on YouTube or filter through a Facebook feed. The effect is that those who do consume news media, like Fox and MSNBC, deliberately select the news that affirms their beliefs, causing them to grow even more convicted in their ideology. Meanwhile, other forms of entertainment and media options are of such volume they are hollowing out the middle, allowing many viewers to become less informed and less politically engaged. The political center hasn’t changed, but the tails have elongated. It’s those on the extremes who tend to vote and engage in politics. The use of The New York Times here can be viewed as a surrogate for the most elite media institutions and how they all set the political agenda. These larger media outlets, with the largest budgets, the strongest, most high-powered sources and the most resources will, by their nature, set the agenda. The smaller outlets with fewer resources will, to some degree, always look to the big dogs to determine what has been deemed “news” and what they, then, need to cover. To what extent political agenda setting is calculated or just natural is up for debate; it’s likely a mix of both. No less, the savvy consumer of news is aware that what is “news” is determined by a small number of elite, powerful media – and, not inconsequentially, their sources. We should always look out for what is not covered by these outlets and consider why. 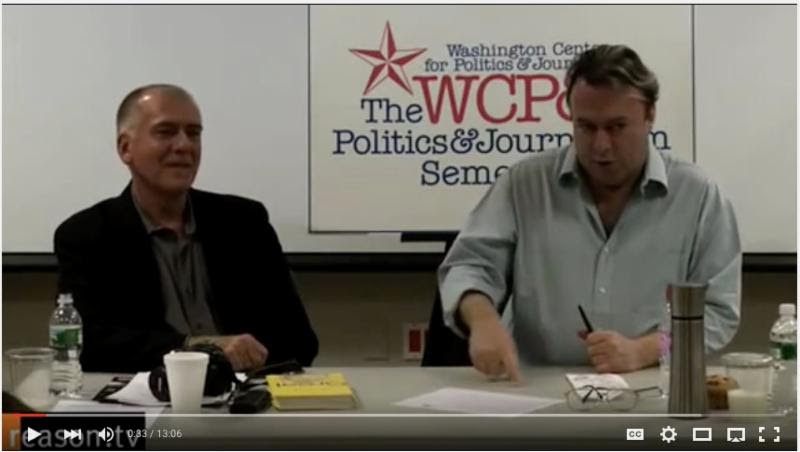 In this ten-minute video, Hitchens outlines tactics elite media use to set the political agenda and shape national dialogue. 8. Make the devil look like God and God the devil: the attacker paints him or herself as the savior so that the opponent can be the doer of some evil. Investigative journalist and former CBS correspondent, Sharyl Attkisson, gained international notoriety when she accused the Obama administration of hacking her computer. She eventually left CBS to write the book Stonewalled detailing her battles with CBS and the Obama administration as she attempted to report on Benghazi, Fast and Furious and Obamacare. In this TEDx Talk, Attkisson reveals the hallmarks of media manipulators and “astroturfers.” Political astroturf is when “political, corporate and other special interests disguise themselves and publish blogs, start Facebook and Twitter accounts, publish ads, letters to the editor, or simply post comments online to try to fool you into thinking an independent or grassroots movement is speaking.” A goal of astroturf is to make people feel marginalized and outside mainstream sentiment, such that they join the movement. Watch and take note of the many ways these organizations attempt to fool and influence you. Fifty percent of our Google clicks go to the top two links on the first results page, which are populated based on how Google wants to rank things. Psychologist Robert Epstein conducted several experiments to determine how Google search results might impact a person’s political choices and repeatedly found the same thing. The top two search results caused a significant share of viewers to perceive the political candidates mentioned in them more favorably. And the majority of participants were unaware that Google can manipulate search results. The implications are huge. What if Google can mine their data, identify undecided voters and put specific candidates in the top links to influence their opinions? What if one candidate serves Google’s interests more than the others? What if Google has an agenda that has nothing to do with their business, like a desire to overthrow Syrian president Bashar Assad? How might Google manipulate search results to advance any of their preferences or whims? In May of 2014, journalist Caitlin Dewey launched a column for The Washington Post called “What Was Fake on the Internet This Week.” Each week, she’d debunk a fake news story that had gone viral online. In December of 2015, she decided to shut down the column. In less than two years, she witnessed the number of sites dedicated exclusively to hoax news proliferate dramatically. The reason? Money. 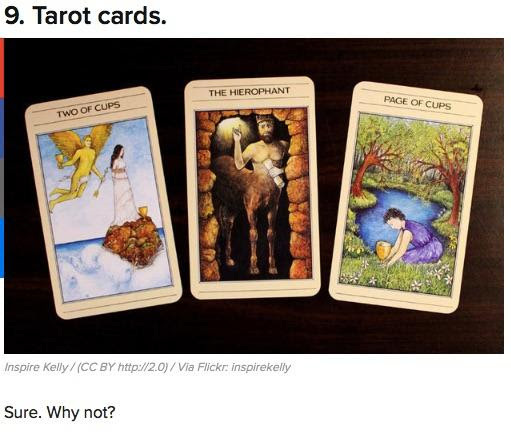 Hoax stories drive traffic and advertising revenue; opportunists got in on the game. Most alarming to Dewey was discovering that hoax news is beginning to have a more partisan edge to it and is, thus, getting picked up by non-hoax, political news sites and passed off as real news. If this continues, will we be regularly exposed to hoax news without knowing it? Are we already? Dewey and her team are currently trying to determine a new format that is better suited to take on hoax news as it seeps into non-hoax media. • The news has no explanatory power: an onslaught of “factoids” will not advance your understanding of much. Understanding is slow and takes effort and patience. • News is toxic to your body: stories that make us panic trigger our limbic system and release cortisol, putting our bodies in a state of stress. This can lead to fear, aggression, tunnel vision and desensitization (not to mention health problems). • News increases cognitive errors: news feeds “the mother of all cognitive errors” – confirmation bias. This causes overconfidence and poor judgment. Per an experiment done in 1997 by the psychology professor who wrote this article, television news makes us anxious and report feelings of sadness, but not just about the news events. The effect of TV news seeps into our consciousness and makes us feel generalized anxiety. That’s right, watching TV news can cause us to worry about personal areas of our lives that have nothing to do with the news we watched! We also tend to “catastrophize” these worries, meaning we worry so much about something that we begin to view that thing as much worse than it is. Rational thought is imperiled. Feeling anxious? Turn off the TV news. Media studies professor, Allison Perlman, studied the effects of people who immersed themselves in news following the Boston Marathon bombing. She found that those who consumed at least 6 hours of media daily about the attack reported more acute stress than did those who were actually at the bombing site. A possible reason might be the way many news outlets cover such events – they show disturbing clips over and over, which can produce PTSD-like symptoms in viewers. What do we gain by endless consumption of traumatic imagery? What do we lose? Research shows that our brains have evolved to keep tabs on perceived threats, like a lion in the midst. This reflex might have outlived its purpose when it comes to the stream of threats the media tells us exist. Our media consumption habits are something we should take care to notice. Particularly when we know that the media is explicitly gunning to get us addicted to it, with ill effects that can seep even into our personal lives. What to do instead? Read books and long-form journalism that attempt to put information in a larger context. Pay more attention to investigative journalism. Expose yourself to a range of perspectives. And remember that it’s not what you know, it’s how you think. Apropos of a smoke-in-mirrors media discussion, this post is actually sponsored by HBO to promote “Last Week Tonight with John Oliver.” No less, this is a fun mood lightener. Three of the 10 follow. Rystad Energy, a consultancy out of Norway, has released data that project the crash in oil prices has cut into upstream investment so severely that natural depletion rates will overwhelm the paltry new sources of supply in 2016. This could push supply into negative territory and, against the backdrop of shirking investment in new oilfields, put supply and demand back in balance as soon as late 2016, according to this analysis. A series of images, the first and last of which follow, depict how regulatory changes in 1997 and technology have made the once relatively simple stock market anything but simple. Follow the link for context and all charts. Reading increases emotional intelligence, sharpens thinking and improves communication skills, posing an arguably direct ability to impact leadership skills. The secret to a successful business book club, per this article’s author, is not just reading business books, but focusing on biographies, history, novels, even poetry. Business relationships can deepen in the process (and some of that media consumption time will get diverted…). In 2015, Millennials surpassed Gen X as the largest share of employees in the workforce. This article lays out four points that leaders would be wise to understand and cater to if they want to keep Millennial employees inspired, motivated and engaged. Why aren’t more Americans working? The employment-to-population ratio (the share of Americans over 16 with jobs) has been rising since September 2013, reaching 59.8% in February. Compared to pre-2008 averages, that number is still low. Which Americans are and are not working and why? Is it gender, age, education attainment, immigrants, technology? Read on for an analysis. This past week, President Obama became the first American president to visit Cuba since President Coolidge in 1928, the impact of which will only be known with time. 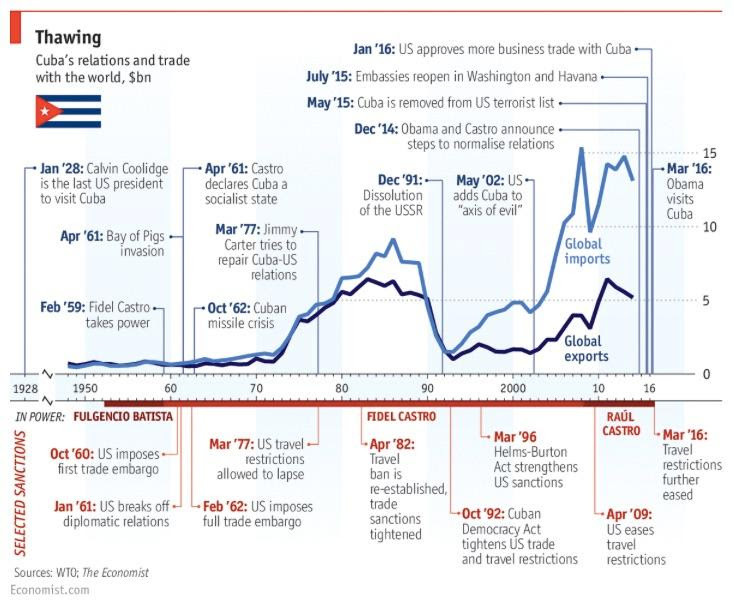 Cuban president Raul Castro has implemented some economic changes that have, so far, only improved the lives of a few and have not yet brought freedom and opportunity to all.